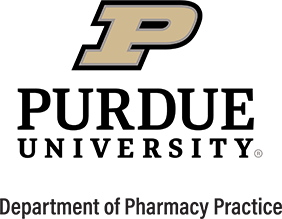 The Department of Pharmacy Practice (PHPR) at Purdue University is an academic department in the College of Pharmacy. It is located in the R. E. Heine Pharmacy Building on the main (West Lafayette) campus of the University and also has facilities in Sidney & Lois Eskenazi Hospital on the Indiana University Medical Center campus in Indianapolis. The mission of the Department of Pharmacy Practice is to demonstrate excellence through performance in the areas of discovery, learning, and engagement. The Department consists of 26 tenure-track faculty, 11 clinical faculty, and over 600 affiliate faculty preceptors. Many faculty practice in specialized areas such as: drug information, critical care, ambulatory medicine, cardiology, outcomes research, infectious disease, pharmacokinetics/pharmacodynamics, managed care, and pharmacy administration. The experience and knowledge of the faculty of the Department of Pharmacy Practice enable professional degree students to receive excellent didactic and experiential training necessary to become well-rounded practitioners. The professional curriculum includes general, scientific, and patient centered content that prepares Doctor of Pharmacy graduates to deliver effective and cost-efficient pharmaceutical care. The Department of Pharmacy Practice supports the College of Pharmacy's vision by: Providing education to students that enables them to acquire in-depth expertise in the pharmaceutical, social/economic management, and related sciences in order to function as educators and scientists in higher education, government service, and the pharmaceutical and healthcare industries Serving the community by engaging in scholarly activities that lead to improvements in healthcare delivery and enhance health outcomes Fostering innovation in research through interdisciplinary collaboration with other schools/colleges within Purdue, other national/international universities, and pharmacy practitioners to enhance to profession body of knowledge resulting in practice advancement Contributing to the profession of pharmacy by participation in leadership roles in pharmaceutical organizations and community programs The Department also has extensive research opportunities for graduate and post-graduate pharmacists leading to M.S. and Ph.D. degrees in either Clinical Pharmaceutical Sciences or Pharmacy Administration. The Graduate Academic Program is directed toward the education and maturation of pharmacists in principles and techniques of research dealing with problems in the clinical, administrative, and educational aspects of pharmacy. These programs also encourage students to develop sound teaching techniques through appropriate coursework and supervised experience. For more information, contact the department at (765) 494-1468.